Before you lose your cool over lice, you should know there are many misconceptions about how lice spread and how they’re treated. It’s that time of year again – the time when parents start getting alerts from school saying head lice is going around in their child’s classroom. On hearing that, most moms and dads start to panic. They start scratching their own heads and want to immediately check their child’s scalp for those pesky little bugs. But before you lose your cool over lice, you should know there are many misconceptions about how lice spread and how they’re treated. These misconceptions only help feed into the anxiety of parents whose children have lice or who have been exposed to lice. Lice do not spread easily. They also cannot survive more than 24 hours off a human scalp. Lice cannot jump. They can only crawl, and as a result, most transmission is only by direct contact. The spreading of lice can happen through the sharing of brushes and hats, but the easiest way lice spread is by head-to-head contact. Children do not need to be sent home from school for head lice infestations. 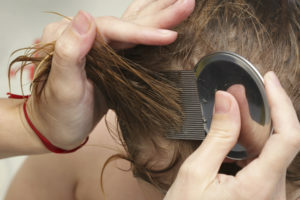 The American Academy of Pediatrics guidelines recommend letting the parent of the child know about the lice diagnosis, but refraining from sending the child home that day or restricting him or her from attending school. A child with head lice has likely had the infestation for at least a month, and studies have shown that lice are not likely to spread within classrooms. Lice affect people in all socioeconomic classes. Lice often carry a social stigma, and in reality, it’s not a reflection on cleanliness. Anyone can get lice! If children are excluded from school and activities, this perpetuates the belief that lice are harmful. Lice are diagnosed by finding live insects on the scalp. So if you’re concerned your little one has lice, or if you received an alert from school, you should check your child’s head thoroughly. To check for lice, look through your child’s hair with a fine comb, looking in particular behind the ears or base of the neck. Look for live lice and nits, which are egg casings. White substances in the hair are often confused for nits. Many people often confuse nits with dandruff, hair gel, shampoo residue, dust or even glitter. Most nits are within a few centimeters of the scalp, as viable eggs are generally only within one centimeter off the scalp. A nit adheres to the hair shaft and is not easily removed. RELATED: Does the ‘Selfie’ Put Your Teen at Risk for Lice? You should only treat your child for head lice if you see live lice or viable eggs. Make sure to check all the members of your family for infestation, and treat everyone at once. First-line therapy is available over the counter: permethrin (Nix) or pyethrins (RID) are generally well-tolerated and have high rates of cure. These treatments do not kill the eggs, and so need to be repeated nine days later. Hair combing should be done while wet and after a treatment with pediculicides to remove any residual nits. Specialized combs are sold for this, but any fine comb will do. This task is somewhat time-consuming, but will help remove the nits. Do not use anything to try to chemically loosen the nits, such as acetone, bleach or vinegar. This may cause harm and hasn’t shown any benefit. There are anecdotal reports that applications of natural products that supposedly suffocate the lice, such as mayonnaise, thick cream or oils, may be effective in eradication. As long as your child does not have an allergy or skin irritation to this product, it wouldn’t hurt, but there are no guarantees it will help. Prescription therapies may be necessary if the first round of over-the-counter treatment is ineffective. If you’ve gone through a treatment course and haven’t had success, talk to your doctor to see if a prescription is necessary. Remember: Do not cover any treatment on your child’s head with plastic. If you need to protect a pillow or other surface, cover the surface with a towel or old blanket that you can easily wash.
Is a cleaning spree necessary? When it comes to cleaning your house after a lice outbreak, remember that lice only live 24 hours to 48 hours off the scalp. So if your child hasn’t touched it a household item recently, you don’t need to worry about it. Sheets, pillows and other items that have close head contact should be washed in water that is hotter than 130 degrees. If the item is something you can’t wash, cover it or put it in a plastic bag for 48 hours. Can Medication Help With Your Child’s Autism? Does Dry Shampoo Actually Keep Your Hair Clean?